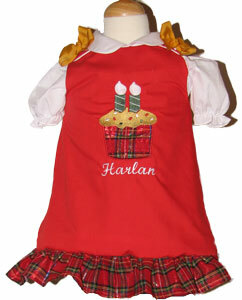 Looking for a special birthday outfit for your little one? 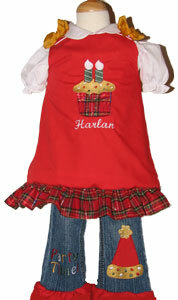 I can make this custom 2-piece birthday set with either a cupcake or cake applique with one to four candles. Is this birthday celebrated around a holiday? I can coordinate colors or work with a specific color scheme to get you the exact look you are hoping for. This photo was of a set I made for a Christmas time birthday party.� This DOES NOT include a white shirt for underneath the jumper.� That was placed under the jumper for pictures. If you just want the dress it will cost less than the jeans and dress together.� Comes with free monogram! !